To celebrate Pentecost this year the church was decorated with ‘tongues of flame’ - a reminder of the tongues of flame that came to rest on each of the disciples when they received the Holy Spirit. We celebrated our Harvest Festival Service in a joint service with St Margaret’s URC on 30 September. In our service we used the image of the rainbow to explore God’s goodness to us in creation, and this theme was reflected in our display. 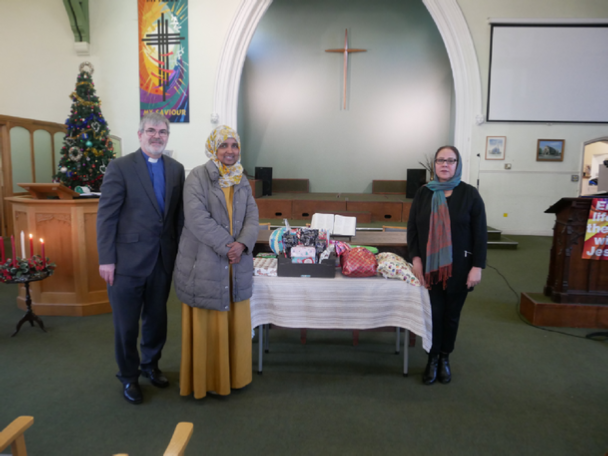 The gifts given by members of the congregation were donated to Homeless Action in Barnet. The stable scene that used to be constructed on the platform, was set up this year in the foyer of the church. It was enjoyed by many people passing by the church, not least in the evening when the lights were left on. We held our annual Toy Service on 9 December when toys were given by members of the congregation for the Barnet Refugee Service.